Juicy pork chops topped with bacon and cheese. 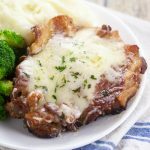 This 5 ingredient Bacon Swiss Pork Chops recipe is quick and easy and an instant family favorite! In a small mixing bowl, combine olive oil and minced garlic. Brush oil and garlic over pork chops with a pastry brush. Place 3-4 half strips of bacon on each pork chops. Bake at 425° for about 30 minutes, or until fully cooked. Remove pork chops from the oven and sprinkle cheese on immediately to melt. If cheese doesn't melt fully, place back in the oven for a minute or two until melted.